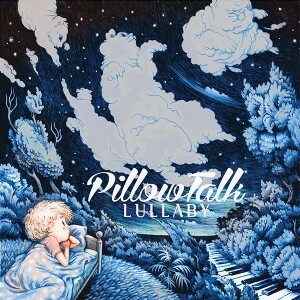 Ever the shape -shifters and genre-benders, on their newest EP “Lullaby” San-Francisco dance darlings PillowTalk move away from their innovative brand of housified soul and look toward the misty terrain of lush, 80s-inspired synth-pop. Turn down the collars on your Izods, switch on your Walkman, and drift into that delicious space between…between waking and sleeping, love and loss, making out and making up. A swirl of Rhodes, tape delay, and pedals, “Lullaby” is more a dreamscape than a track. Inspired by work from acclaimed illustrator David Polonsky, “Lullaby” is a sonic map of that perpetual dusk in which the tender of heart dwell. Cascading handclaps, delicate bubbles and squeaks, and a characteristically spare kick are cut through by a punchy live bassline that exudes more humanity than a million synthesizers could ever imagine. For a sense of the mood just imagine sweet caresses through a fog that barely obscures your lover’s face, or an old teen romance on faded VHS. When vocalist Sammy D, sounding more pensive and breathless than ever before, obliquely asks an unnamed someone, “you’re not a weapon, are you?” one wonders if he’s not thinking about PillowTalk’s own ability to destroy our own expectations about what dance music is supposed to be. For all the sullen moodiness of “Lullaby,” the EPs B-side, “We All Have Rhythm,” brings a return of the sassy, white-boy R&B swagger we’ve come to know and love from the boys. No more feeling sorry for ourselves, we’re all invited to sing along over a slice of uplifting electronic psych-funk that is sure to wake up any slumbering afterparty.